There are several areas of a pet's body that help determine the animal's body condition. The pet's ribs should have a slight amount of fat covering them, but each rib should be distinct. If the pet's ribs are visible, the pet is too thin. If you can't feel the ribs at all, the pet is overweight. Another area to check is the base of the tail. A slight layer of fat should cover this area and it should feel smooth. If the bones protrude, the pet is very thin. 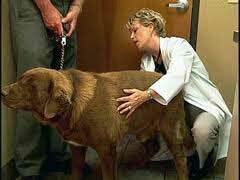 If you can't feel any bones, the pet is overweight. Other areas of bony prominence include the hips, shoulders and spine. Again, a small amount of fat should cover these areas. If you look at your pet from above, the animal should have a definite waist behind its ribs. If there is no waist, or if the area between the ribs and hips is wider than the hips or ribs, the animal is exceedingly overweight. Now look at your pet from the side. Cats and dogs should have an abdominal tuck, the area behind the ribs should be smaller in diameter than the chest. Overweight animals have no abdominal tuck. If you feel your pet is overweight or underweight, the Atlantic County Animal Shelter recommends you consult your veterinarian. For more information about responsible pet ownership, call the shelter at (609) 485-2345.